"Artist Marjorie Van Cura's bold work stands apart for its graphic savvy. Her dynamic aesthetic is a constant force as she explores the chaos and order in natural disasters through continuous line drawings." See the exhibition on Artsy here. UMass NYPOP Gallery is proud to present de/Constructing Worlds, an exhibition of the work of five UMass Amherst alumni artists based in New York City. The meaning of the word “world-building” has evolved in the 200 years since it was first introduced. Today, the term most often refers to entire fictional worlds complete with their own histories, languages, ecologies, and even laws of physics. Popular culture is so inundated with these fictional worlds that we have almost come to expect them as an integral component of our literature, film, television, and games. The artists in this exhibition exist somewhere between these two definitions. Their work reads like specimens or artifacts taken from some imagined world - incomplete relics that only tell us a part of the story. LiC-A/The Plaxall Gallery is pleased to announce fever, an exhibition by a selected group of artists that explore the different takes on climate change/global warming through thought provoking and poetic interpretations on the subject. Featuring painting, sculpture, photography, video and installation, along with informative quotes from world leaders, that challenge and bring awareness to an issue that affects us all. Artists included are J.F. Bautista, Violet Baxter, Patricia Bouley, José Carlos Casado, Carol Crawford, Joseph De Leo, Everything Is Collective, Jean Foos, Orestes González, Jean-Marie Guyaux, Ivana Larrosa, Jim Lee, Guido Manuilo, Nancy Miller, Cristián Pietrapiana, Mary Pinto, Nancy Rakoczy, James Seffers, Andrés Senra, Ruth Somalo, Sharon Taylor, Marjorie Van Cura, and Zelda Zinn. features the work of thirty-two artists who represent a range of styles and a truly national reach. 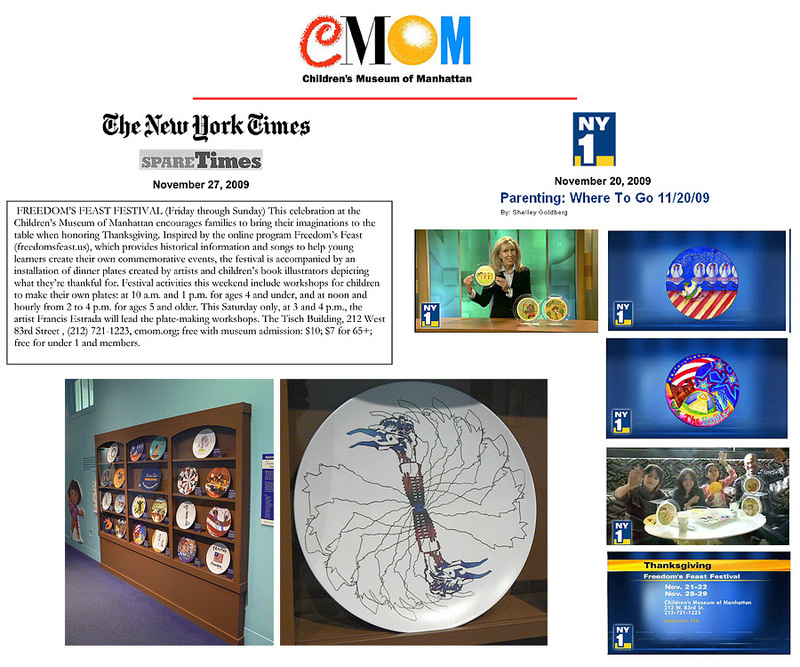 The work was selected from over a thousand entries by independent curator, Priscilla Vail Caldwell. Blue Mountain was privileged to have her serve as juror. Caldwell is an independent curator, advisor, writer and former Director at DC Moore Gallery in Chelsea. She has written extensively on modern and contemporary American painting and sculpture and has curated hundreds of solo and group exhibitions. Featuring 110 artists...painters, sculptors, graphic artists...exhibiting works no larger than 12 inches square, in a wide range of materials and creative expression. I will show a 2014 ink on rag paper painting from my Superstorm Series. View the gallery invite here. View reception and installation photos here. "LIC Open Studios: 10 Must See Artists"
I was in studio on Saturday and Sunday, May 21/22 from 12-6pm. I exhibited 3 diptychs, 4 paintings and 14 graphite or ink drawings. 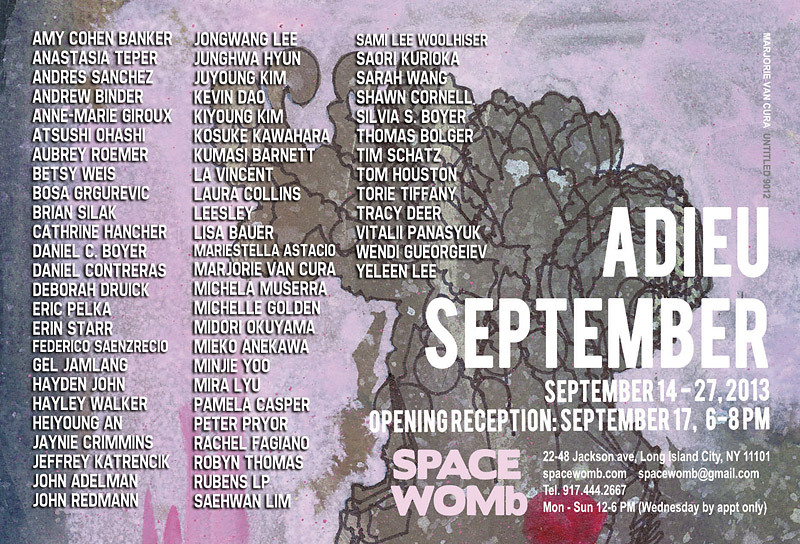 Curated by Richard Mazda for LIC Arts Open. I exhibited one of my new diptychs at the Long Island City Artists Group Exhibition, May 18-22, 2016 at The Falchi Building, 31-00 47th Ave, ground floor. "An Antidote to the Art Fairs: Open Studios in Long Island City"
"Some highlights of the evening were the very different urban landscapes of artists Violet Baxter and Marjorie Van Cura. Baxter’s were like tone poems of the streets and buildings around her studio, while Van Cura presented lyrical and minimal environments rendered in mixed media on film." Celebrating Queens Artists & LIC-A’s 30th Anniversary - this exhibition features a survey of artwork by 34 members of Long Island City Artists (licartists.org). On view are two recent paintings on polyester film from my Untitled Drought Series. Featured artists are DJ Leon, Antonio Carreno, Stan Munro, Abigail Goldman and Marjorie Van Cura. 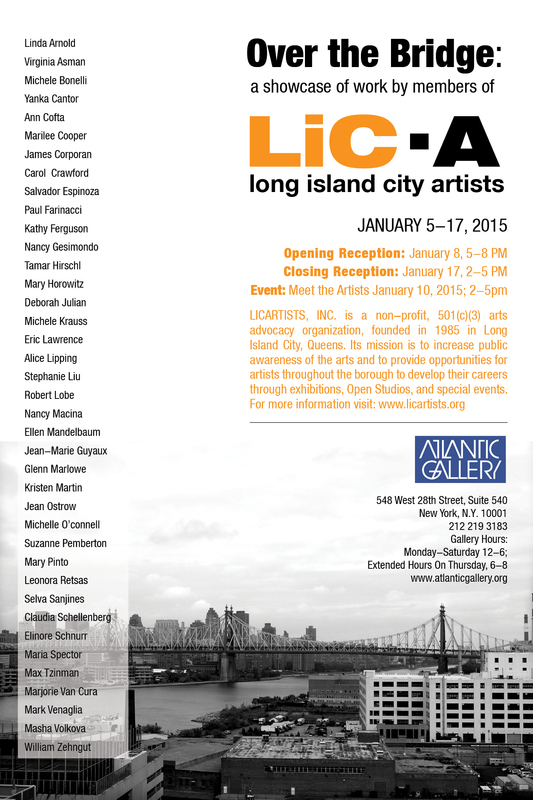 A group exhibition featuring the works of 39 Queens-based artists, all of whom are members of LICArtists, Inc., opens January 5, 2015, at Atlantic Gallery, 548 West 28 Street, suite 540, in the Landmark Arts Building in Chelsea, Manhattan, NY 10001. A reception for the artists will be held on Thursday, January 8, from 5-8pm. An informal Art Talk event will be held Thursday, January 10th, from 2-5pm, to meet the artists, who will introduce themselves and discuss their works and the new growing art scene in Long Island City with those attending. In addition a continuous digital slide show will provide a brief tour of the some of the art venues in Long Island city. A closing reception will be held Saturday, January 17, from 2-5pm. All events are free and open to the public. Thanks to Madelyn Jordon Fine Art, my work is now available on Artsy and ArtNet. Very exciting! Featured artists are Antonio Carreno, Diane Cherr, Joellyn Duesberry, Kathy Ferguson, Stanford Kay, Anne De Villemejane, Ken Elliott, DJ Leon, Marjorie Van Cura and Joyce Weinstein...and Kenneth Noland! Dutch Kills is pleased to announce “Unsound Practice,” a group exhibition curated by Christine Kennedy showcasing six artists whose work investigates the interplay of visual art, sound and text. Featuring the work of Matthew Callinan, Jools Johnson, Tom McCloskey, Jo-ey Tang, Mikel Telleria and Marjorie Van Cura, this exhibition takes as its point of departure the contemporary experience of an excess of “noise.” If the phenomenon of “noise” characterizes the information age, constituting a soundscape of competing voices, textual and discursive networks, transmissions and communications— how has this transformed both what and how we "see;” how do such plurivocal emissions –as well as their suppression, loss or erasure-- influence contemporary image-making and the cultural production and status of works of art?